Located in one of the most diverse neighborhoods in the city, the recently expanded Jackson Heights Greenmarket is our largest and busiest market in Queens. Beautifully situated along the edge of Travers Park, this bustling Sunday market draws a large crowd of families, long-time residents and young couples who come out to shop, enjoy the lively scene, and meet and greet their neighbors. The Friends of Travers Park designated 78th a "playstreet" where they host family-friendly events each Sunday adjacent to the market, making this market a real destination. 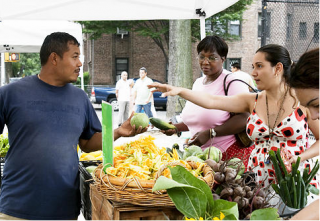 Reflecting the culinary diversity of the neighborhood, the Jackson Heights market offers a wide selection of vegetables, fruits, eggs, fish, honey, chicken and specialty Mexican produce. This season we are adding more poultry, pork, cut flowers and an even greater variety of fruit.